For just the second time all season, the No. 8 Angelina College Lady Roadrunners suffered a defeat. Both of those losses came to the No. 2 team in the nation, the Trinity Valley College Lady Cardinals. AC’s ladies led at the half, only to see the Lady Cards do what they usually do in clamping down defensively in the final two quarters. TVCC allowed just one AC player to reach double figures with Natasha Mack’s 14-point night, leaving the Lady ‘Runners on the short end of a 62-53 final. 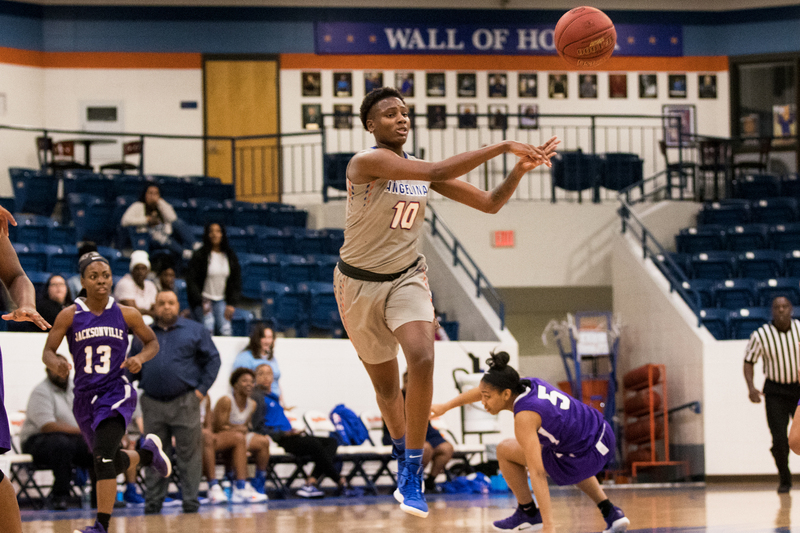 While a road win would have been nice, the Lady Roadrunners have loftier goals in mind – and seven more regular-season games to achieve them. With the conference tournament looming just three weeks away, AC (20-2, 9-2) will look to get back on track beginning with Saturday’s home game against Coastal Bend Community College. The Lady Cougars are 6-17, 3-8 on the season following Wednesday’s 65-59 win over Jacksonville College. Game time at Shands Gymnasium is 2 p.m. Fans can view the action via live streaming by logging onto angelinaathletics.com.